The future of our planet depends on sustainability. This is why we are your experts to producing sustainable solutions for our customers. We are the specialists in producing and supplying innovative and application-oriented bioplastics solutions. 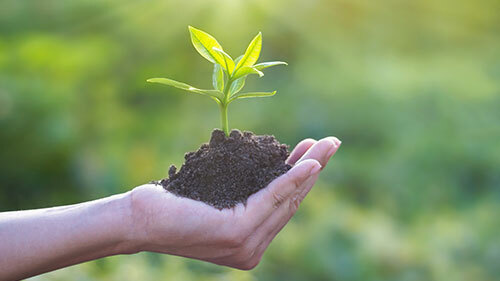 Depending on your requirements, our compounds are biodegradable in various environments or suitable for long-term use and either completely or partially made from renewable sources. We can produce many different types of bioplastic compounds according to your requirements. Our years of experience in producing biodegradable and biobased plastics mean we can support you with customised technical solutions that fit perfectly to your specific applications. Why Should You Use Biodegradable and Biobased Plastics? Waste management is a serious challenge for mankind. In order to achieve a sustainable future, solutions must be developed that help reduce our dependence on fossil resources whilst improving the carbon footprint of products such as packaging materials. Bioplastics are already available as market-ready solutions and used in a wide variety of applications. Our products are well established across a wide variety of applications. Our bioplastic film compounds can be used for shopping bags, fruit and vegetable bags as well as for agricultural applications and a lot more. Our bioplastic materials for injection moulding can be used for coffee capsules, cutlery, plant clips and so on. Find out more about our biodegradable and biobased plastics. With over 50 years of experience in plastics, BIO-FED and the Feddersen Group can offer you professional consulting services, customer-focused service and unbeatable sales and distribution operations. Thanks to our state-of-the-art compounding and laboratory facilities, we can assist you with your application development and technical needs. Find out more about our services. Read more about BIO-FED and our connections to the international Feddersen Group. Find out about career opportunities at BIO-FED and why it is a great place to work. Read the latest news from BIO-FED and find information about upcoming events. Would you like to find out more about our sustainable plastic solutions? Then talk to one of our specialists.